Article updated in June 2017. Social Media in the Photo Booth or How to Deliver photo booth pictures to end users. Nowadays people are crazy about publishing their photos on social media. The Photo Booth is a perfect Selfie Station the problem is that the main functionality of the photo booth is to take and print photos. There are two options available that will ADD the ability to deliver photos taken in your photo booth to the end user or end user's Social media sites. The functionality of each option is different. The operating cost and requirements are different. One option is to provide the means for users to access their Social media sites (Facebook, Twitter, Instagram etc.) through your photo booth or separate SM station. Other Option is to provide users with the ability to download photos taken in the photo booth to smartphone/tablet and let users to access Social media sites from their phones/tablets. Both options will deliver photos taken in the photo booth to the end users. It comes down to personal preference and cost associated with each option. (Facebook, Twitter, Instagram etc.). Also there are options to email the photos or send SMS/MMS text with the photos to user cell phone. 1. Software that will enable social media functionality. There are some photo booth software as well as additional third party software that will let you upload photos to users social media accounts and/or email the photos or send SMS/MMS text with the photos to user cell phone. 2. Constant and reliable Internet connection. 1. PRIVACY ISSUES. Privacy issues will arise IF the Photo Booth Software or Third party software provides access to ALL PHOTOS TAKEN IN THE PHOTO BOOTH TO ALL PEOPLE THAT ARE ACCESSING THE SOCIAL MEDIA UPLOAD FUNCTIONALITY. In other words if the software offers the access to all photos to everyone, one person could potentially use the photos of other person without permission. The same is true if you will upload all photos to your own (business) social media account. The implications of violating the privacy of an individual person could be damaging. 2. TIME DELAY. PHOTO BOOTH SOFTWARE WITH BUILT IN SOCIAL MEDIA ACCESS. IF the photo booth software has the social media access at the end off the photo session each individual will be prompted to sign in into their personal Social media account to upload pictures that were just taken in the Photo booth it will require too much time for typing the information on touchscreen. This will create a significant delay between each photosession and can be frustrating for those waiting in line. Also another factor contributing to TIME DELAY is that only One user can use SM access at the time. 3. MOBILE/CELLULAR NETWORK: AVAILABILITY AND OPERATING COST. Maintaining an internet connection at the event requires additional devices such a mobile hotspot. You will be totally dependent on Cellular network availability. There are situations where Cellular network either simply not available (mostly in rural areas) or building structure is blocking the Cellular network signal strength. Also having a mobile hotspot can be quite expensive depending on the market. 4. THIRD PARTY SOFTWARE. Nothing is wrong If you decide to use a Third party Social media software in addition to your photo booth software. You will have to buy a separate software (one time or yearly/monthly subscription) and perhaps an additional devices (some SM stations are installed on separate tablets) have to be added to your photo booth setup. This Option will let your photo booth users access their photos and download them to their Smartphone/Tablet via WiFi. The internet connection is not required/needed. 1. Software that will enable photos transfer via WiFi. The PTBooth A1 PRO Version includes PTBooth Transfer App. It provides access to photos (view and download) taken with PTBooth Photo Booth Software to all external devices (Smartphones, Tablets, Computers) connected to the PTBooth computer via WiFi Hotspot (internet is not required). 1. PRIVACY ISSUES ADDRESSED. 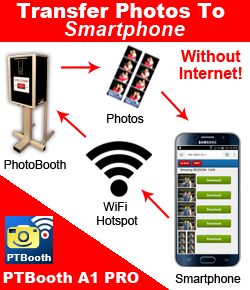 Because the PTBooth Transfer App is utilizing special identifier for each individual photosession a user can access photos from only one particular session. The RISK OF VIOLATING THE PRIVACY OF AN INDIVIDUAL PERSON IS GREATLY REDUCED. 2. TIME DELAY ADDRESSED.The PTBooth Transfer App works independently from the main/parent PTBooth software functionality (take and print photos). You simply continue your normal photo booth operation(take and print photos) while users are accessing their photos. Multiple users can connect and download photos at the same time. 3. INTERNET IS NOT REQUIRED. No need to worry about maintaining an internet connection and the cost associated with it. Provides access to photos (view and download) taken with PTBooth Software to all external devices (Smartphones, Tablets, Computers) connected to the PTBooth computer via WiFi Hotspot. CUSTOMERS DO NOT NEED TO INSTALL ANY ADDITIONAL APPS in order to download the photos. Customers only need to CONNECT to your WiFi Hotspot and USE the PHONE BROWSER. Watch the PTBooth Transfer App functionality in action. We hope this article will help you to make sound decisions when it comes to implementing and using Social media component for your Photo Booth.